Are the Berries on My Juniper Bush Edible? Several varieties of junipers are native to the United States, from tall trees to bush-like formations. All have lacy, leathery evergreen foliage. Junipers produce dusky blue berries that are actually cones containing seeds. 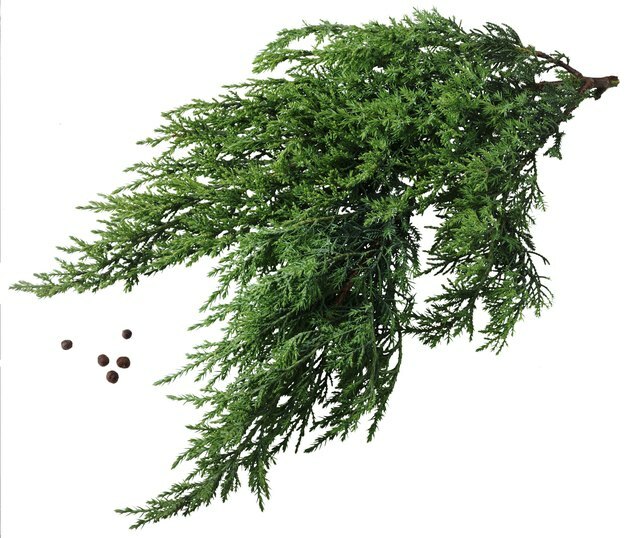 Birds, foxes and other wild animals eat juniper berries. Native Americans used juniper berries in some dishes and medicines. The berries on your juniper bush are edible, provided you observe a few cautions. Juniper berries have an astringent taste and odor. Juniper berries give gin its characteristic bitter taste, and add flavor to marinades and spice rubs. You shouldn't plan on eating more than a few berries at a time. Oil of juniper is a powerful diuretic, and the Children's Hospital of Philadelphia's Poison Control Center reports that eating more than a few juniper berries can cause abdominal cramps and diarrhea. To use juniper berries to flavor a meat marinade, pick two or three berries, wash them and drop them into the marinade liquid. Let the marinade sit in the refrigerator a few hours or overnight to absorb the flavor of the berries. Juniper berry-flavored marinades are popular for wild game, particularly deer. You can also add a few juniper berries to the wood chips used to smoke meat to add an aromatic tang to the smoky flavor. The whitish blush on the outside of juniper berries is wild yeast. You can make a sourdough starter by mixing a cup of flour, three or four berries and 1/4 cup water in a glass jar. Let sit in a warm place, loosely covered, until the mixture begins to form. Remove the berries and use the starter as you would any other sourdough starter. Some people have also brewed beer with the yeast from juniper berries. Whenever using wild yeasts, be wary of contamination by other bacteria. If you notice any discolored patches or growths in your starter, discard it immediately. Do not use juniper berries from bushes that have been sprayed with pesticides. Avoid berries from bushes that border roads, since these may have been exposed to car exhaust and other toxins. Always wash the berries before using. Never exceed the amount of berries called for in your recipe. Keep the berries away from small children and pets. Can I Eat Wild Blackberries?